"... I felt the Hopper's wing slice through my head, and for a moment, I saw my body standing there. Then the King appeared in a flash of light. 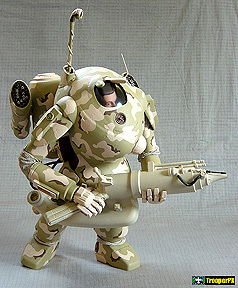 He said 'Don't worry baby, let me sing you a song'..."
The original Roughneck Joe was made over seven years ago, solely as entertainment, to fulfill a personal need for better Starship Troopers toys. In 1997, decent toys just weren't available. The original "Johnny" figure was so well received that a few were made for friends and other collectors. Twenty complete figures were assembled over the following year, and all have been reassigned to happy homes around the globe. Roughneck Joe is the ultimate collectible for any Starship Troopers fan, and my continued passion! This year we finally see Armor and Accessory Kits available, for you to assemble and finish into your own squad of Mobile Infantry figures. I have personally taken on the obsessive task in recreating as many of the main cast of characters as possible. It has been a labor of love for several years, but finally, the Roughneck Joe family is growing. Various characters, kits and accessories are will be added as the pages here are updated. "Terra PAWS" and the "Terra PAWS Logo" © Copyright David Ramsay 2000~2006.